Are we still on the right track? Answering this question in a collaborative effort of the scrum team as well as internal (and external) stakeholders is the purpose of the sprint review. Given its importance, it is worthwhile to tackle the most common sprint review anti-patterns. The sprint review is about Scrum’s core principle: inspect & adapt. The development team, the product owner, and the stakeholders need to figure out whether they are still on track delivering value to customers. It is the best moment to create or reaffirm the shared understanding among all participants whether the product backlog is still reflecting the best use of the scrum team’s resources. It is also because of this context that calling the sprint review a “sprint demo” does not match its importance for the effectiveness of the scrum team. The sprint review is thus an excellent opportunity to talk about the general progress of the product. The sprint review’s importance is also the reason to address sprint review anti-patterns as soon as possible. 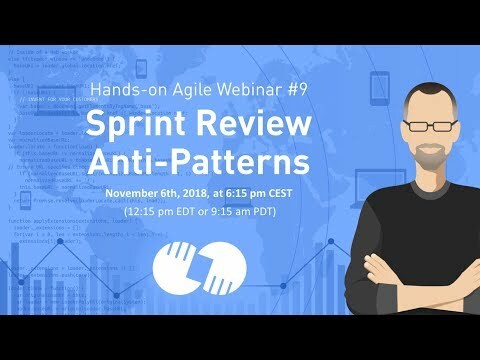 Note: If the browser will not start the video automatically, click here to watch the replay of the webinar sprint review anti-patterns directly on Youtube. Typically, you can observe the following sprint review anti-patterns. This ebook covers over 160 Scrum anti-patterns, and it is available for free right here. Download the “The Scrum Anti-Patterns Guide” now! Side gigs: The development team was working on issues outside the sprint scope, and the product owner learns about those for the first time during the sprint review. No stakeholders: Stakeholders do not attend the sprint review. (There are several reasons why stakeholders do not go to the sprint review: they do not see any value in the ceremony. It is conflicting with another important meeting. They do not understand the importance of the sprint review event. No sponsor is participating in the sprint review, for example, from the C-level. To my experience, you need to “sell” the ceremony within the organization. Scrum’s sprint review is a simple yet meaningful ceremony. It answers the question whether the scrum team is still on track delivering value to the customers and the organization. Avoiding the sprint review’s anti-patterns can significantly improve a team’s effectiveness. Are sprint review anti-patterns missing? Please share with us in the comments. I invite you to join the “Hands-on Agile” Slack team and enjoy the benefits of a fast-growing, vibrant community of agile practitioners from around the world. If you like to join now all you have to do now is provide your credentials via this Google form, and I will sign you up. By the way, it’s free. Scrum: 19 Sprint Planning Anti-Patterns. SCM == Scrum Master??? It’s usually abbreviated SM. CSM is Certified SM and PSM is Professional SM, based on the certificate issuing group. Is referring to the Scrum framework as a”Method” (or process) a sign? An anti-pattern is a common (incorrect/inefficient/risky) practice (pattern) which is applied to a recurring or common problem. Therefore it is a sign that there is a deeper issue which needs to be addressed. It is an anti-pattern to use the Sprint Review as a stage gate indicating a knowledge gap in the purpose of the Scrum framework. Using and acting in terms of a project is an anti-pattern of the Scrum framework indicating a knowledge gap in its product-centric focus. Addressing opportunities to improve behaviors should be the focus. Question: Is that a “sprint review” if you only have it once at the end of the project? I doubt that this would classify as Scrum in the first place. One other sprint review common error : THE all-in one final sprint Review. May be just question of wording. Personally, as a SCM, when I talk with anyone of the extended team ( Team = PO, SCM and dev team, extended team includes Stackholders, technical expert, architects, all people that can be involved occasionally during the project) I use “anti-patern” for key issues and I highlight “signs” of issues for concrete wrong behavior, wrong action and I try to correct the anti-patterns revealed by the signs rather than trying to correct the sign. I fully agree with that situations you described about are BAD one . No doubt about it. But I think most of them are signs, more than anti-paterns.